Happy 2014 everyone! After a much needed break over the holidays, I am feeling refreshed and ready to get back into cooking, reviewing and blogging! I hope all of you had a glorious end of 2013 and that the new year brings you joy, prosperity and mindfulness. What a better way to start off a new year than by…er…eating donuts! Yeah, I realize that this probably goes against most people’s resolutions to be healthier and eat better, but I am a firm believer in “everything in moderation”. It’s very rare that I get a hankering for donuts, but when the craving comes on it hits hard. The itch for sugary fried dough came on strong the other morning and in my brief insanity I almost proposed a drive to Ronald’s Donuts in Vegas to fill the need. 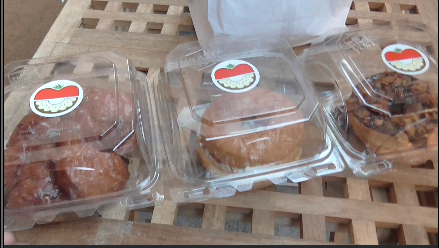 Fortunately (or unfortunately, however you look at it) L.A. doesn’t have a ton of options for vegan donuts. There are Fonuts, which are incredibly delicious, but don’t exactly fit the traditional donut mold and the one donut place in Santa Monica that served a vegan glazed version stopped doing so recently (bastards!). 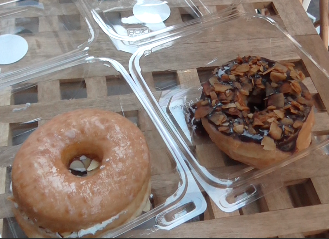 I grabbed my camera, hopped in the car and took off towards Highland Park to stuff my face with vegan donutty goodness. Donut Friend is unlike any other donut shop I have been to. You can make DONUT SANDWICHES filled with whatever your heart desires: cream, mousse, jams, nuts, glazes, COCONUT BACON – many of which are vegan! I mean, come on now, even if you’re trying to eat better one of these a year isn’t going to kill you! Check out my video and full review below to get all the deets!